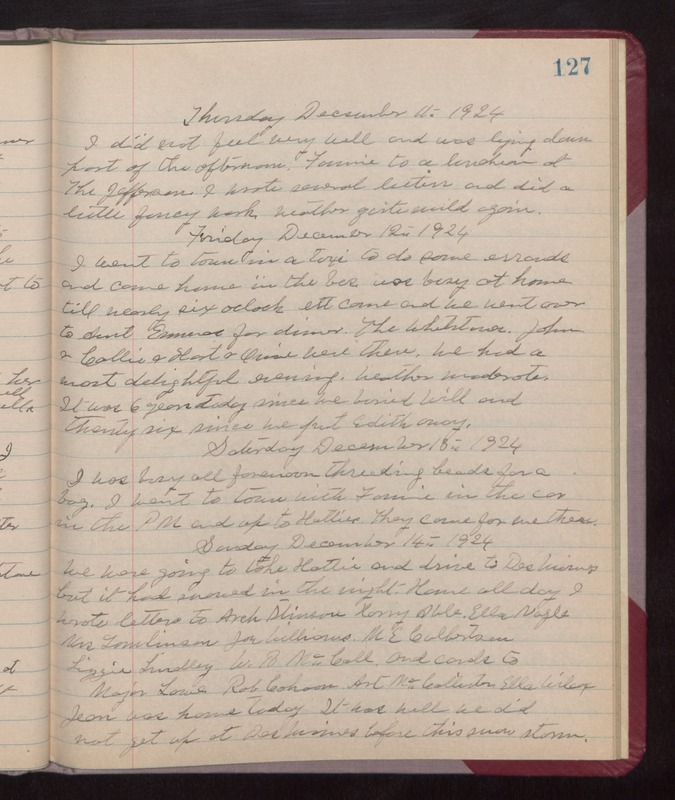 Thursday December 11th 1924 I did not feel very well and was lying down part of the afternoon. Fannie to a luncheon at The Jefferson. I wrote several letters and did a little fancy work. weather quite mild again. Friday December 12th 1924 I went to town in a taxi to do some errands and came home in the bus. Was busy at home till nearly six oclock. [Ott?] came and we went over to Aunt Emmas for dinner. The Whetstones, John & Callie & Hart & Orie were there. We had a most delightful evening. Weather moderate. It was 6 years today since we buried Will and twenty-six since we put Edith away. Saturday December 13th 1924 I was busy all forenoon threading beads for a bag. I went to town with Fannie in the car in the PM and up to Hatties. They came for me there. Sunday December 14th 1924 We were going to take Hattie and drive to Des Moines but it had snowed in the night. Home all day. I wrote letters to Arch Stinson, Harry Able, Ella Nagle, Mrs Tomlinson, Joe Williams, M E Culbertson, Lizzie Lindley, W. B. McCall and cards to Major Lowe, Rob Cohoon, Art McCallister, Ella Wilcox. Jean was home today. It was well we did not get up at Des Moines before this snow storm.